First prepare your pie crust and cream cheese filling. In a medium sized bowl, mix cream cheese, vanilla and sugar. 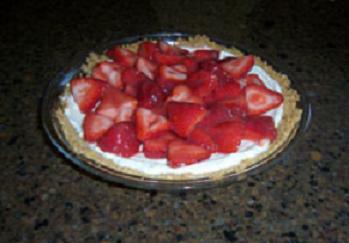 Spread carefully over graham cracker crust. To make spreading easier, make sure the cream cheese is really soft (even microwave it for a few seconds) and place dollops of the mixture all around the crust, then carefully spread it. Refrigerate at least 2 hours or until cream cheese is firm. Then, mix strawberries with the glaze and pour over the cream cheese mixture. Combine strawberries and sugar in a blender. Pour mixture into a cold saucepan. Before putting the pan on the burner, mix together the cornstarch and water and add this to the strawberries in the pan. Cook over medium heat for about 5-6 minutes, stirring frequently until bubbly and thickened. Cool before combining with fresh strawberries for the above recipe. Makes 2.5 cups. Cook's notes: This glaze can be refrigerated for up to a week or frozen and then thawed. 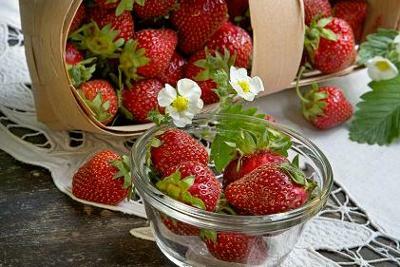 If the glaze is cold, you may need to microwave it for about 30 seconds in order to blend it easily with strawberries. This is a great way to preserve a taste of summer in your freezer for use when strawberries aren't as tasty or readily available. If you don't have a ready made pie crust you can make your own by following the directions below. In a medium bowl, mix together graham cracker crumbs and sugar. Add the melted butter a little at a time, stirring in between additions. Pour mixture into a 9" glass pie plate and press crumbs evenly on the bottom and sides, making sure there are no bare spots. Bake in a 350'F oven for 10 minutes. Cool. I have made this pie and it is delicious, and comes to you compliments of Make Dinner Easy, which is a site full of useful, wholesome recipes. Thank you Crystal, for sending us this wonderful recipe! I can't wait until next summer to try this recipe! Join in and write your own page! It's easy to do. How? Simply click here to return to Strawberry Recipes.